You are currently browsing the tag archive for the ‘Hugh Harman’ tag. In 1933 the Harman and Ising studio had lost their deal with Leon Schlesinger to produce cartoons for Warner Bros. They had not yet got their later deal with MGM, and were in sort of a limbo, doing odds and pieces for several bidders. One of the most surprising contracts they got was to produce two Cubby the Bear films for the New York-based Van Beuren in 1934. 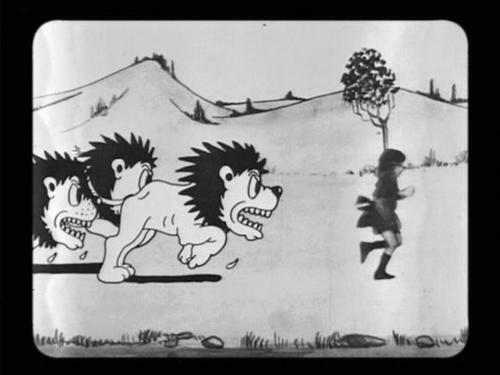 Van Beuren had his own studio making Cubby the Bear films, so what made him contracting Harman and Ising remains a puzzle. What’s clear, however, is that Harman & Ising’s Cubby was a far cry from Van Beuren’s own output. Harman & Ising’s Cubby was in fact, Bosko but in a different design. His movements and spirit were indistinguishable from Harman & Ising’s former star. Like their cartoons for Warner Bros., Harman & Ising’s two Cubby the Bear films are animated by the same crew who had made the Bosko cartoons (e.g. Friz Freleng and Robert McKimson, before Schlesinger hired them away), resulting in cartoons that are at least well animated. In the first of the two films, ‘Cubby’s World Flight’, Cubby follows Oswald (‘The Ocean Hop‘, 1927) and Mickey (‘Plane Crazy‘, 1928) in a Charles Lindbergh-inspired aviation film. Cubby starts flying alarmingly low, which leads to gags that go all the way back to ‘Plane Crazy’, he then crosses the United States, only to dive through the earth to reach China at the other side. Undaunted and with seemingly limitless supplies of fuel, Cubby flies over Russia to France, but above the Atlantic his plane is destroyed by a thunderstorm. Luckily our hero lands safely on the statue of liberty. ‘World Flight’ is practically indistinguishable from the early Warner Bros. films, and has little to do with Cubby as conceived by the Van Beuren studio itself. However, it’s a rather uninspired film, low on gags, and with an all too episodic story. In the best Warner Bros. tradition it features caricatures of the four Marx Brothers and of Maurice Chevalier.